The big horse show is about to start! The rider is already quite nervous, and her gorgeous Arab mare is prancing about in agitation. To calm her down, the rider gives her a few delicious apples and they're ready to go! 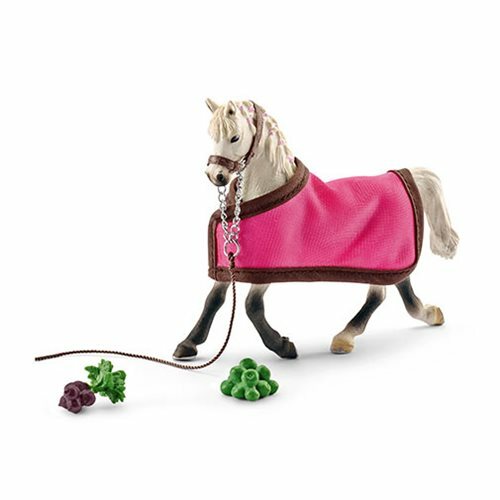 This terrific Horse Cub Arab Mare Collectible Figure measures about 7 1/3-inches long x 6 1/2-inches tall and features an Arabian mare figure, a headstall, a removable blanket, a green apple, and a beetroot. Rider figure not included. For even more fun, collect and play with all the finely detailed Schleich Horse Club playsets and figures. They encourage children to play and learn at the same time! Each sold separately.